Gabion baskets are gaining popularity in both residential and commercial landscapes. What was once only used for utilitarian purposes is now seen as artistic expression. Today you can find gabions used as benches, tables, fencing and more. A quick Pinterest search takes you down a gabion inspired rabbit hole you might never recover from! Whether you enjoy DIY landscaping projects or just want to have an ultra-unique mailbox, this post is for you! We have done all the heavy lifting so sit back, relax, and don’t fall asleep along the way. Try to “fit” the rock pieces together like a puzzle if time and energy permits. First things first, here are the tools you will need for your gabion mailbox plus the items you will (probably) need to grab at your local hardware store. Need suggestions for rock filler? Make sure you don’t choose a rock size that is smaller than the mesh of your welded wire or the rocks will fall right through! Determine proper location and desired height of your new gabion basket mailbox. The USPS recommends a mailbox height of 41 – 45 inches. For more information (Do you really want MORE info?) on USPS mailbox guidelines, click HERE. Dig a 18 – 24 inch hole for the base of your fence post. Following the instructions on the bag, create your cement mix. Once the cement is ready, place your wood post in the hole and fill the hole with cement. Make sure you have your level handy to ensure the fence post is straight before the cement hardens. Let the post set for 6-8 hours while the cement cures. Using the welded wire, create a basket shape with the desired diameter. In order to fasten the sides of the wire basket, use the excess wire ends or wire ties to fasten your basket sides together. We do not recommend using plastic zip ties because they will become brittle in the sun and eventually break. Place basket over the post. Make sure to bury the basket at least 6 inches below the surface to stabilize the basket before you install the rubble. Once the basket is in place, begin adding rock to the inside until it’s completely full and surrounds your fence post. Drill a small hole in the top of your fence post to fasten your mailbox using supplied hardware. If your mailbox comes with special brackets, skip this step. 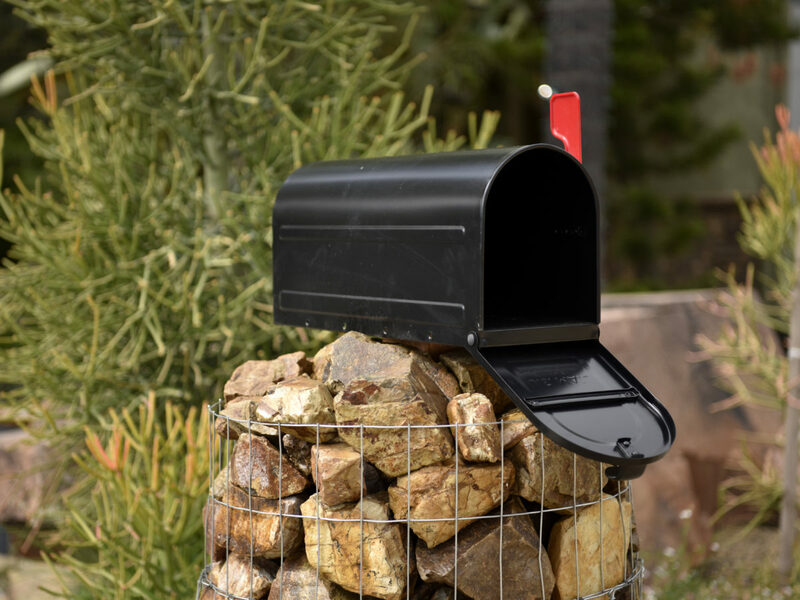 Test out your new gabion mailbox!